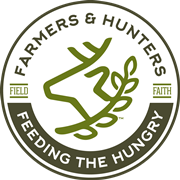 Videos - Farmers and Hunters Feeding the Hungry - Hunt Down Hunger! Some of the content on this page has been produced and submitted by individuals and outside parties to be featured on our website. FHFH is not responsible for the information and activities depicted and described in those videos. Rick Wilson, Executive Director and Founder of FHFH, recounts his experience many years ago like it happened last week. He was about to begin an incredible journey — a mission to feed God’s hungry children that would involve thousands and feed millions! Rick Wilson describes how the FHFH venison feeding program works. Learn about the hunger problem in our country and how FHFH is solving the hunger problem. Brad Ingram, a hunter, tells why he is involved with FHFH. Hear stories from Food Banks and Feeding Ministries that have benefited from venison donated by FHFH. Franklin Apartments residents received venison as part of a weekly food distribution program provided by Adventist Community Services of Greater Washington. The venison came from the Manna Food Center which received venison donations from FHFH. The Table of Grace ministry at Essex United Methodist Church feeds the hungry of their community and benefits from venison donated by FHFH. Hear their story. Bethesda Cares is a community outreach program for the homeless and people in need. Their mission is to respond with compassion and creativity, to help the homeless and persons in need in the community. Lawrence Blake, Lunch Program/Clothing Closet/Shower Coordinator at Bethesda Cares, expresses his appreciation for the venison donations by FHFH. Bill Ewing, past director of Maryland Food Bank, shares the role and of food banks that provide food to the hungry, and how FHFH is helping to meet their need. Find out about the role farmers play in the FHFH program. Southwest Ohio FHFH, along with 3 other conservation groups, were asked to set up a booth at the Miamisburg, Ohio Field & Stream retail store and educate the public about FHFH. They had to convince each person, via a wooden chip, that they had the best program that day. At the end of the day, the group with the most chips, was awarded a $500 grant from the store! Young people nationwide are surprising their parents by deciding to donate their first deer to help feed the hungry! Feeding others - part of the heritage of hunting - is now being passed on to a new generation of hunters.